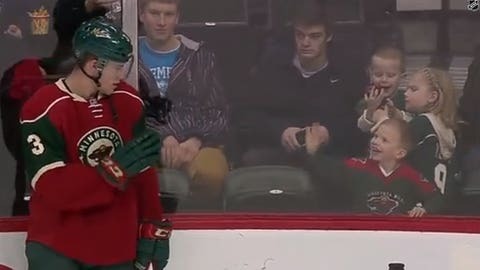 Minnesota Wild forward Charlie Coyle waves to 5-year-old fan Henry. St. Paul, Minn. — What started as the simplest of gestures has turned into a newfound friendship between Minnesota Wild forward Charlie Coyle and 5-year-old Henry, thanks to a video that has gone viral on the internet. During Minnesota’s warmups earlier this month, Coyle happened to notice a young fan waving at him from other side of the glass. The 21-year-old Coyle waved back briefly, and Henry put his hands over his mouth in disbelief that one of his heroes acknowledged him. It’s something that could have happened at any NHL rink on any given night, but this incident just happened to be caught on camera. "I think a lot of guys do it around the league," Coyle said. "You see a little fan or something or a little kid, you’ve been in that position before when you were younger. It’s just something little that you do." Two weeks after the wave seen around the world — the 21-second video has been watched more than 2.3 million times on YouTube — Coyle got to meet his young fan in person. Henry and his 8-year-old sister, Madeline, were accompanied by their parents, Jason and Heather, as Coyle spent time with Henry after the Wild’s practice Monday at Xcel Energy Center. As Coyle walked into the room, Henry — wearing his red No. 3 Coyle jersey — was all smiles, much like what happened a few weeks ago during the Wild’s warmups. Henry’s parents say they’ve tried to keep their son grounded since he was the recipient of a friendly wave from Coyle. "It’s a lesson on how quickly things go viral," said Jason. "At first it’s a little funny, then it gets to be a little bit scary. You definitely appreciate that it’s for something good. It’s not so much about Henry as I think it is about Charlie Coyle and what a great guy he is." Henry’s family first found out that he’d made it on TV during the second period of the game when they received a text message. Coyle, meanwhile, heard about the incident via a postgame phone call from his mother. "A lot of people were asking me about it and saying it was a cool thing," Coyle said. "It happens every day with people. Someone just happened to see this instance. I think he broke a lot of hearts with that." During their meeting with Coyle, Henry and Madeline had their matching No. 3 jerseys autographed by the Wild forward. In exchange, they presented him with a few gifts of their own. Henry colored a picture of the Wild’s logo and gave it to Coyle, while Madeline made him a bracelet. Coyle also talked hockey with both kids, who play the sport in Shakopee, Minn. In fact, Henry challenged Coyle to a skating contest. "I wish me and you could do a race," Henry told Coyle. "I think it’d be a close one, what do you think?" Coyle said. "You think you could beat me?" "Yeah," said Henry, who wants to be a goalie and told Coyle he wanted to face him in a shootout. "I don’t think I’d be waving, though. I’d be trying to score on you," Coyle said. "Would you be waving at me still?" Henry replied that he still would. And so a friendship was born between a professional hockey player and a young fan who looks up to him. The gesture was so simple, but the impact will no doubt be long-lasting. "Charlie Coyle obviously gets it," Jason said. "He understands how much of an impact he has on little kids’ lives. Hopefully more folks out there, more pro athletes and famous people see that and take a page out of Charlie’s book."